It’s official…the ‘green Oscars’ are back. The sixth Observer Ethical Awards, in association with Ecover, have been launched with an all-star judging panel whose eco credentials are truly second to none – including Ecover’s very own managing director Mick Bremens and marketing manager Clare Allman as well as Oscar winning actor Colin Firth and model Lily Cole. The awards recognise organisations, individuals and young people whose work makes day-to-day ethical living more accessible and achievable. Recognition for this work is vital to a more ethical future, so Ecover is once again proud to be the headline sponsor. Last year’s winners include Hugh Fearnley-Whittingstall, who beat Jamie Oliver and Joanna Lumley to take the title of Campaigner of the Year for his Landshare project. This year the public can once again vote to decide who will join Hugh in the eco limelight as Campaigner of the Year, as well as voting for the best ethical Local Retailer, Online Retailer and Global Campaigner. Mick Bremens, managing director of Ecover, comments: "The Observer Ethical Awards are a hugely exciting project for us to be involved with and we are looking forward to seeing which innovative, inspirational and likeminded organisations and individuals will win this year. Our hope is that through our day-to-day work and support of the awards we will encourage many more people to follow an ethical way of living." As always members of the public are able to nominate the best and brightest individuals, organisations or companies who continually strives to put the environment first, then visit www.observer.co.uk/ethicalawards to register your nomination. You could win one of a host of amazing eco prizes just for registering your vote, but get in there quick as voting closes on 11th March. 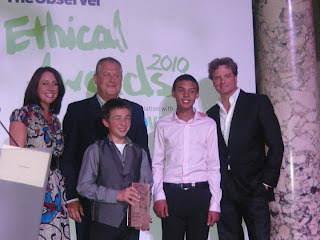 If you want to keep up with the latest Observer Ethical Awards news, click here and ‘Like’ Ecover’s page.